Having just completed a massive thirty-six date North American tour supporting Mayhem, the ABIGAIL WIILIAMS touring machine will continue on the road this week for six headlining dates, beginning in Wilmington, Delaware tonight. Taking only a few weeks off after this run of dates, ABIGAIL WILLIAMS hit the road on another set of headlining performances on their way to provide direct support for Dark Funeral’s North American assault engulfing all of February, immediately followed by a full tour with Deicide through the end of March! A full list of tour dates is posted below. ABIGAIL WILLIAMS‘ massive ongoing tour schedule is to pummel audiences with new material from the band’s new album, Becoming. Confirmed for release in North America on January 24, 2012, once again on Candlelight Records. The band’s third full-length Becoming is already stirring interest in the Metal media; its organic, churning tracks offering some stark contrast to previous ABIGAIL WILLIAMS releases. The first single from Becoming, “Ascension Sickness,” in its second week at radio has already broken the top 20 on CMJ (on a 11-minute single!). The track continues to get heavy requests and plays nationwide as the track continues to infect the masses. Stream “Ascension Sickness” right here. Clocking in at nearly an hour in length, Becoming ushers in a provocative new chapter for the adventurous band. Containing six vast tracks, truly the band’s most expressive and complicated to date, Becoming was recorded in various warehouses throughout Los Angeles, with the lineup for the album including returning guitarist Ian Jekelis, studio drummer Zach Gibson (ex-The Black Dahlia Murder) and as always, vocalist/guitarist Ken Sorceron, who handled all mixing, mastering, production and engineering duties. View the cover art by infamous graphic artist Metastazis (Morbid Angel, Watain, Ulver, Nachtmystium, etc.) and more at this location. Preorders for the record are available from Candlelight. American Black Metal outfit ABIGAIL WILLIAMS are in the final stages of mixing for their anticipated full-length album right now. The title of the forthcoming opus is now confirmed as Becoming, confirmed by Candlelight Records for release in North America on January 24, 2012, marking ABIGAIL WILLIAMS‘ third full-length release for the label. Following a warm-up headlining gig tonight in Trenton, New Jersey, ABIGAIL WILLIAMS will be providing support for Norway’s Black Metal legends Mayhem as their massive thirty-six date North American tour gets underway this Wednesday in Baltimore. Hate and Keep Of Kalessin will both provide support for the entire trek as well, and ABIGAIL WILLIAMS‘ labelmates Woe will also perform in eight cities of the tour. ABIGAIL WILLIAMS will begin recording their third full-length album today, (September 15, 2011). The process begins in the band’s new home of Southern California as the band enter Keene Machine Studios with The Faceless’ Michael Keene and band frontman Ken Sorceron engineering. 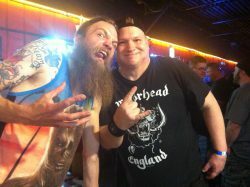 Former ABIGAIL WILLIAMS and Black Dahlia Murder drummer Zach Gibson will be playing on the album, as previous band mate Ken Bedene focuses on The Aborted. ABIGAIL WILLIAMS will continue recording the new album over the next month, set for completion in late October before embarking on their previously announced North American tour supporting Norway’s legendary Mayhem. The new album has an anticipated January release, followed by additional U.S. tours supporting Dark Funeral and then Deicide. Stay tuned for more updates on ABIGAIL WILLIAMS as the record takes shape and as they hit the road on a massive tour schedule, over the next 6 months and onward. ABIGAIL WILLIAMS – Apostles Of Darkness Over The Americas Tour Begins March 9th, 2011! 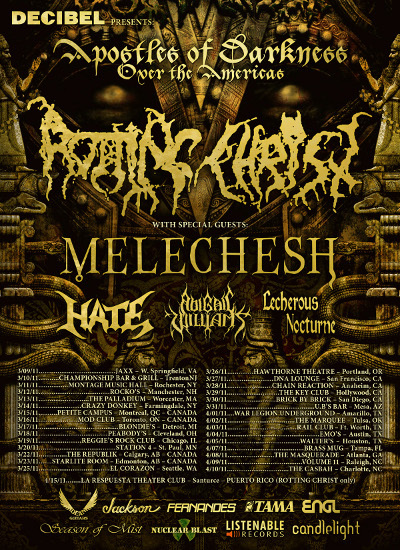 ABIGAIL WILLIAMS – their thirty date North American tour alongside Melechesh, Hate, Lecherous Nocturne and headliners Rotting Christ embarks this Wednesday, March 9th in Virginia. 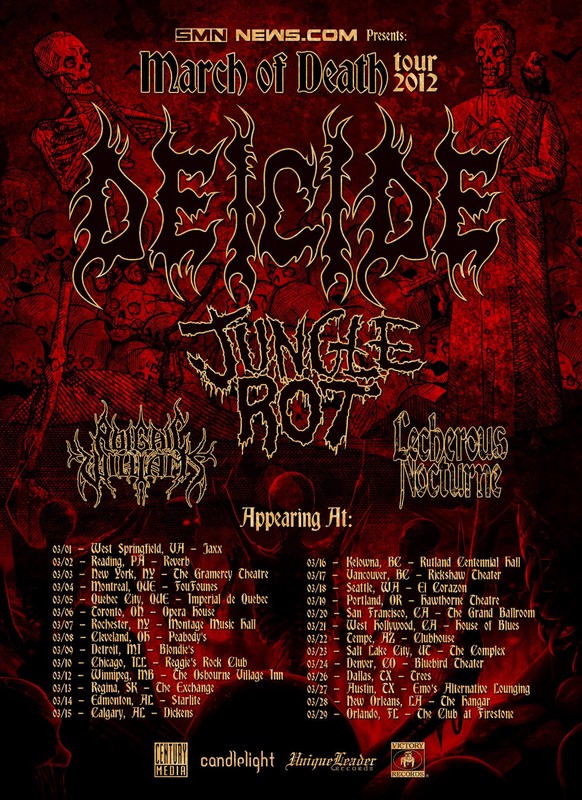 Dubbed the Apostles Of Darkness Over The Americas, this massive Black/Death tour lineup shall easily prove to be one of the most Extreme Metal tours of 2011 so far. 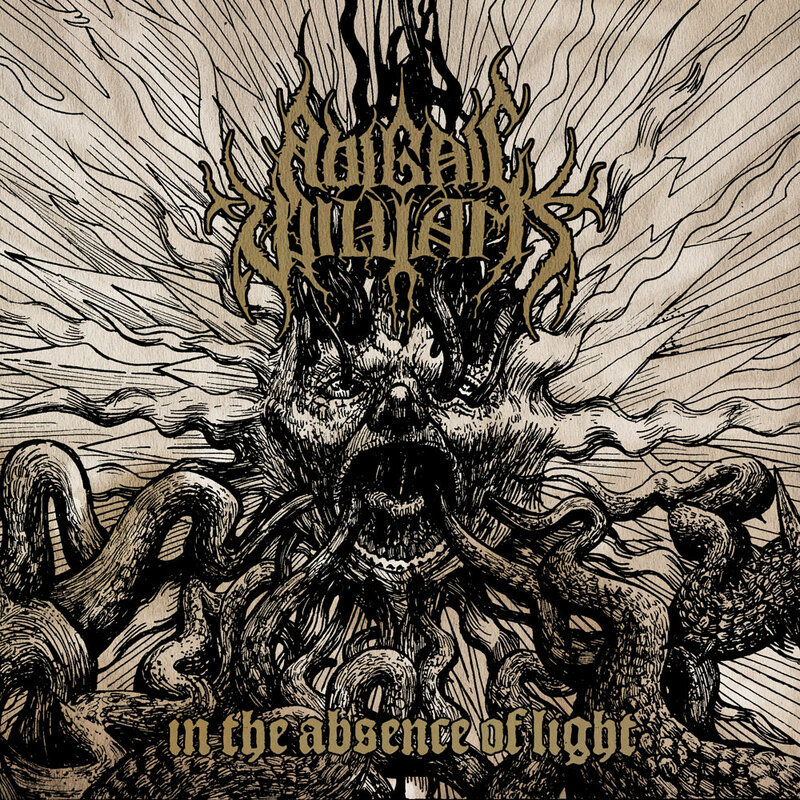 ABIGAIL WILLIAMS’ latest album In The Absence Of Light was released in September via Candlelight. Recorded at Conquistador Studios in Cleveland and mixed by Peter Tagtgren (Dimmu Borgir, Immortal, Celtic Frost) at Black Lounge Studios in Sweden, the album presents founder/vocalist/guitarist Sorceron with new guitarist Ian Jekelis and drummer Ken Bedene. The album’s eight songs, written exclusively by Sorceron, contain far more urgency then the band’s previous material, cutting down on snyth and keyboards without depleting their crushing atmospheric capabilities, while adding a more brutal, sinister edge to their attack. I have added a new band to my Black Metal favorites list, they are Abigail Williams. Abigail Williams is void of having the heavy grooves of Satyricon’s superior recent releases, void of having the progressiveness of the incredible Enslaved. What Abigail Williams does offer up musically, is the extreme and brutal sounds of Black Metal. Yes, the very, very, heavy side of Black Metal. The layering of music is similar to what Cradle of Filth has accomplished with their infamous albums, minus any over exaggeration of melody. O.K., I have pointed out where Abigail Williams lines up musically, compared to their Black Metal counterparts, (or some of them anyway). On “In The Shadow Of A Thousand Suns”, (released on October 28, 2008 – candlelight records), Sorceron on lead vocals is alarmingly convincing, while the entire band plays very tight, giving every indication musically, that they know these are ten solid songs. If you are looking for a seriously heavy, fast and Extreme band, regardless of the genre, Abigail Williams will engulf your musical senses with unrelenting and foreboding Black Metal force. This is a Black Metal band that sounds like they have been set loose from any musical restraints, given the command to set forth and spread their onslaught of enraged Black Metal unto the masses. The symphonic moments heard throughout this album lends itself as the bridge, that connects this Black Metal extremity of aggressiveness. After a couple of listens to “In The Shadow Of A Thousand Suns”, I realized that I waited too long to purchase this Black Metal creation. Abigail Williams has made one fine, full length album, of Extreme Black Metal music with this release. I hope that any band lineup changes that have occurred, will not prevent Abigail Williams from moving forward with powerful momentum. Sorceron is the nucleus of this band, he must continue to surround himself with quality musicians, just like the lineup found on this album. This is my Metal opinion and I recommend Abigail Williams “In The Shadow Of A Thousand Suns” to anyone who’s interest I may have peaked. Abigail Williams as they appeared on “In The Shadow Of A Thousand Suns” are: Sorceron on lead vocals & lyricist, Mike Wilson on lead guitar, Plaguehammer on bass, Bjornthor on guitar, Trym on drums, Samus on drums and Ashley Ellyllon on keyboards and piano. 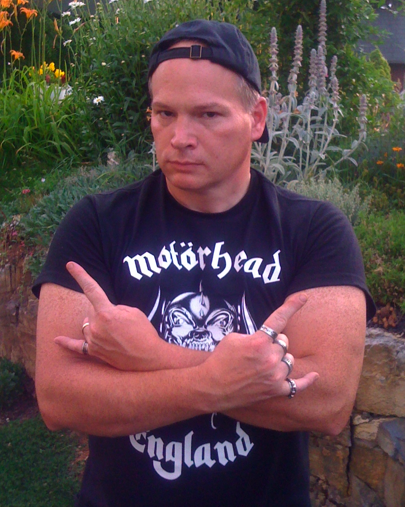 Sorceron also plays guitar, bass and keyboards on this album as well. James Murphy appears as a guest guitarist.